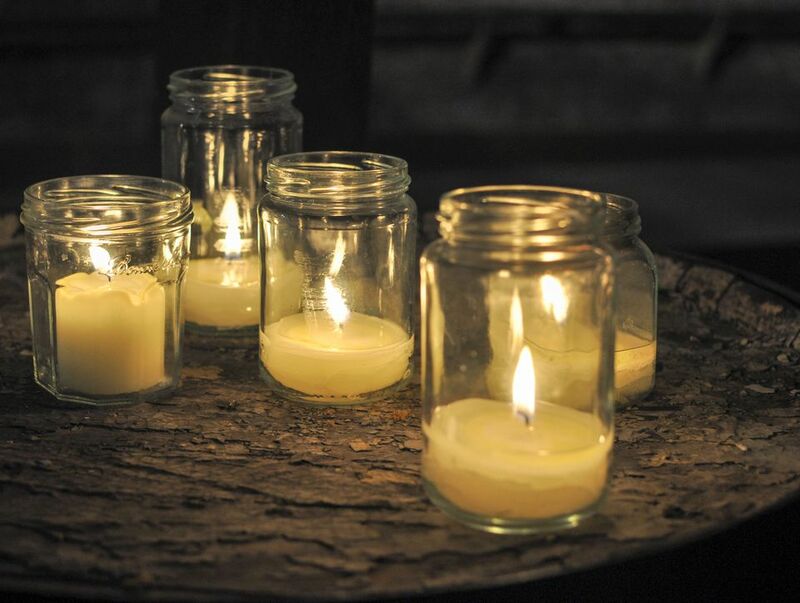 Container candles are a great way to start making your own candles because they're very easy. While many people start with a plain jelly jar, the variety of containers that you can use is endless. It sounds pretty simple, right? You would be amazed at how many unsafe homemade container candles are made. These can easily lead to a catastrophe and possibly burn down your entire house. Since this is such an important safety issue, let's talk about each of these three rules in more detail. This seems like a pretty obvious rule to follow, but it's broken all the time. Making a candle out of a birch bark bowl, a coconut shell, a plastic margarita glass, or anything you can't hold an open flame to is a definite no-no. Another widely reported example of this is using flower pots or other porous ceramic containers for candles. A porous material like terra cotta can soak up the wax. It's possible that this can, in effect, become a giant wick that causes an enormous flame to rise up along the rim of the flower pot. Is that physically possible? Yes. Is it likely? No. The wax absorbed into the pot would have to get incredibly hot to burst into flames. Nonetheless, it is highly recommended that you coat any porous ceramic containers with two heavy coats of decoupage medium such as Mod-Podge before you make the candle. And again, don't ever make a candle in a container that can burn. It does not matter how pretty it looks or how sure you are that the flame won't even get close to the edge of the container. A leaking container is a problem in two ways. First and foremost, you don't want hot melted wax spilling out onto your counter, coffee table, mantle, shelf, or nightstand. It's a big mess! Secondly, depending on how quickly or how suddenly the wax leaks out, a leak could cause a fire hazard. If the melted wax leaks out of the candle as quickly as it is melted, your wick is going to burn higher and larger than it should. You could have a very big flame in just a few minutes. Turning your back for even a small amount of time means this can easily get out of control. The most common leaky containers are metal tins that have a seam along the side or bottom. The best way to test a tin to see if it will hold hot melted wax is to fill it with water and let it sit a day or two. This is perhaps the most common container candle problem. It's also the one that can cause the biggest problems. Similar to a leaking container, a cracked container is going to spill hot wax all over. Also, the wax-soaked wick is going to be suddenly left with no pool surrounding it, and the flame can just as suddenly grow to be several inches high. The flame can quickly grow high enough to catch nearby drapes, a cabinet, or a plant on fire. There are countless stories and urban legends about exploding gel candles as well. The majority of these are a result of the gel getting too hot and cracking the fishbowl, martini glass, or other unsafe glassware it was made in. In addition to being resistant to fire, leaks, and cracks, look for containers that are heat-resistant. Even if your candle burns properly, the wax pool and flame get hot as it burns, so your container needs to take that heat. This is why jelly jars have been so popular over the years. They are designed to withstand high heat and they hold wax very reliably. Other types of glassware are perfectly fine too, as long as it's thick enough to withstand the heat. Ceramic bowls, properly treated flower pots, and well-sealed metal tins can be wonderful containers as well. They're often more heat-resistant than clear glass. Be sure to take into account the shape of the container. If it has a wide mouth and is narrow at the bottom, it's going to get hotter and hotter as it burns and may be prone to cracking. The important thing to remember is that any container—even one designed to be heat-resistant—can crack. The most important safety consideration for any candle is proper supervision. Be sure that the candle is on a heat-resistant surface, away from anything flammable, and never leave a burning candle unattended.